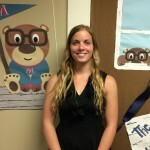 Brittany Nielsen (M.A., California State University, Long Beach), a graduate student in Experimental Psychology and member of the research team in the Cognition Underlying Behavior (CUB) Lab, received the 2015–2016 Graduate Instructor Excellence in Teaching Award at the University of Mississippi Graduate School Doctoral Hooding Ceremony on May 13, 2016. In addition to a monetary award, Brittany received a Golden Apple trophy and will have her name engraved on a plaque in the library. “This is a big honor for Brittany and something that all of us in Psychology can be proud of,” said Michael T. Allen, professor and chair of psychology. Nielsen is interested in examining the utility of different cognitive based interventions used in schools to help children with their executive function skills.